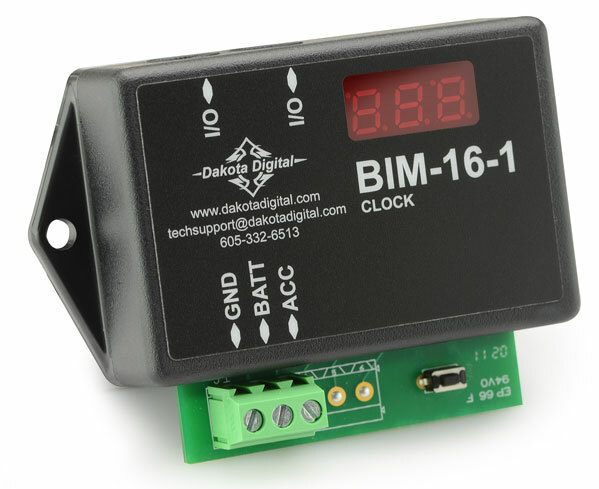 The Dakota Digital BIM-16-1 is the perfect addition to your VFD gauge cluster. The BIM-16-1 allows you to have a clock in any vehicle whether or not it had a clock to start with. Simply plug the BIM-16-1 Clock module into any VFD system (with plastic control box only) and you're done, no cutting holes and no unsightly mouting hardware. Provides either 12 or 24 hour formats. The BIM-16-1 is not necessary when using the RTX, HDX or VHX Series of instrumentation since a clock is a standard display within those instrument systems. *The BIM-16-1 is designed to supply this information to the VFD3 systems with a black plastic control module. For any BIM-compatible control boxes which contain the 3.5mm headphone jack BIM input, add part number 394193 adaptor harness. Earlier instrument systems with an aluminum control module are not capable of BIM connectivity.